Crisp. Cool. Delicious. There are numerous versions of this recipe floating around and there isn’t really a wrong way to make it. Come to think of it, I’m not sure I’ve met a broccoli salad that I haven’t liked. This particular combination of ingredients was passed along from a colleague and we’ve probably made it a dozen times in the last six months with every intention of having it on stand-by with Spring here and Summer around the corner. 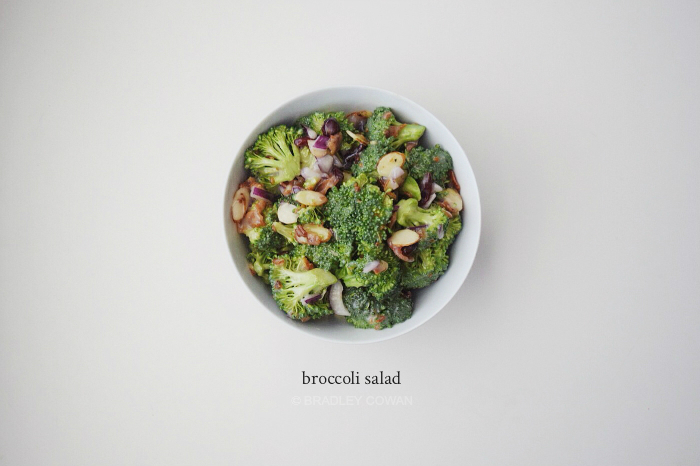 Mix broccoli, red onion, bacon, craisins and almonds (or sunflower seeds) in a bowl. In a separate bowl mix the mayonnaise, sugar and vinegar together pouring over the broccoli mix once combined. Serve immediately or refrigerate until ready. Enjoy!